fourth annual Women's Empowerment Conference & Scholarship Luncheon. The event which will also commemorate the fifth anniversary of the organization, will be held on Saturday March 17th, 2018, at Jungle Island in Miami, Florida. Hon Mrs. Justice Zaila Rowena McCalla, OJ, former Chief Justice of Jamaica who will be the keynote speaker at the Scholarship Awards Luncheon. Chief Justice McCalla joins a notable list of empowering women who have graced the JWOF conference stage sharing the hills and valleys of their climb to such prestigious positions. 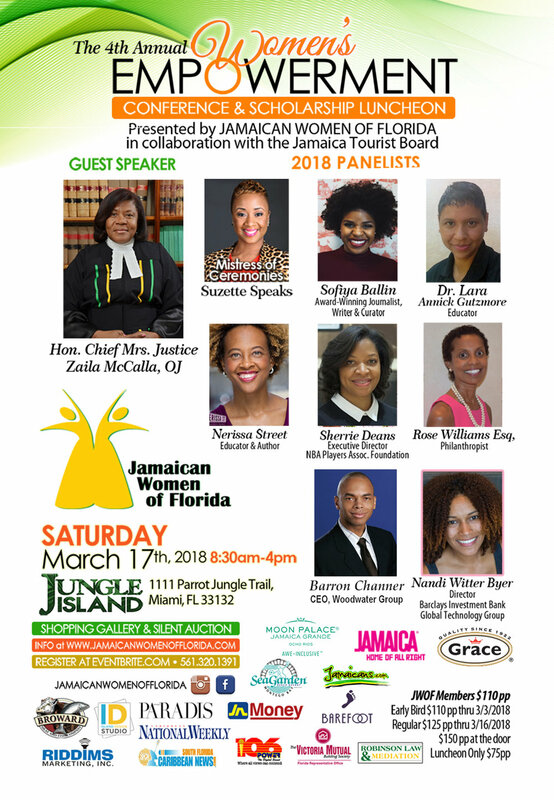 She will be joined by other high achievers who will share their stories of challenges and success while representing the trail blazing spirit that Jamaican Women of Florida embodies. These include award-winning journalist, writer and curator, Sofiya Ballin; educator, Dr. Lara Annick Gutzmore; educator and author, Nerissa Street; executive director of NBA Players Association Foundation,, Sherrie Deans; Philanthropist, Rose Williams, Esq. ; and Barclays Investment Bank Director, Nandi Witter Byer. The panelists will be joined by Mr. Barron Channer, Chief Executive Officer of Woodwater Group, who will share a male’s perspective of women breaking the glass ceiling. Channer has been described as a rising figure in the real estate industry and emerging business leader in the South Florida community. scholarship “Powerful Women….Next Generation Scholarship”. Since its inception in 2014, the first scholarship awardee Jaime Noicely, recently graduated from Florida Atlantic University having completed an Undergraduate program in Criminal Justice and Philosophy. London, England, in recognition of her contribution to the law in Jamaica. corporate and entrepreneurial, including the millennials. The day continue to burst with high energy and enthusiasm as the throngs of women share practical business skills, create access to coaches and mentors to guide and share their experiences, and networking to enable opportunities and growth through informal sessions and discussions. will also include a silent auction, a day long shopping gallery with unique items, a signature to JWOF events, and culminating with a wine-tasting soiree for conversation and entertainment. continued to impart knowledge, mentoring and paving the way for the next generation through a variety of support programs, scholarship fundraisers, and charitable events. The annual conference highlights the culmination of support for upcoming powerful young women.